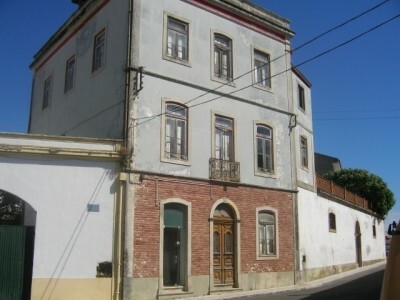 An imposing seven bedroom period townhouse for sale close to Abrantes in central Portugal. The house, which is set over four floors, is connected to mains water and electricity and has a courtyard garden. The property has many original features including a glazed tiled facade, Juliet balconies and mosaic flooring. The property would suit a conversion into a bed and breakfast establishment due to it’s size and location. The property has wooden framed windows and doors with some internal shutters. In addition to a tiled faced to the front there is a decorative moulding on the roof line, typical for a building of it’s age and size. The property has a large (500 square metre) courtyard garden, which is totally private. This walled garden can be accessed either from the house or view two separate vehicle gate ways. Both of these gate ways have carved stone lintels. Ground Floor: The ground floor of the property has served several purposes in the past, both as a house and a shop and thus there are still two entrances to the front. The shop has it’s own fully glazed door access and leads into a spacious room with high ceilings. This room has a wooden floor and ceiling. At the rear of this room there is an office, which also has a wooden floor. There are also storage rooms to this floor, which can be accessed from either the ‘shop’ or the courtyard garden, as can a partially tiled bathroom. There is a double opening decorative wooden door, with a half moon glazed panel above, to the front of the property which leads into a light and airy hallway. This hallway has a tiled floor and tall, wooden skirting boards. There is an ornate wooden staircase, with wooden balustrade and spindles, off the hallway. There is a living room off the hallway, which has a wooden floor, ceiling and internal shutters. First Floor: There is a second living room to the first floor. This living room also has a wooden floor and ceiling and internal wooden shutters as well as two sets of part glazed patio doors, which lead out to a veranda overlooking the courtyard garden. To three walls of the living room there are hand painted ‘landscape’ murals, which date back over 100 years. Some of these paintings are in relatively good condition. There are three bedrooms to this floor, all of which have wooden floors and ceilings. One of these bedrooms is double aspect. There is a partially tiled bathroom with a bath with shower above, toilet, bidet and pedestal sink. The kitchen is also located on the first floor. There is a large, traditional fireplace within the kitchen as well as a marble sink and drainer. Off the kitchen there is a pantry. Second Floor: There is a further living room to the second floor, which has a wooden floor and ceiling. Access to two further bedrooms is off this living room. There is a third bathroom to this floor, which is partially tiled. A hallway leads to a further bedroom, which has a wooden floor and ceiling, as well as a treble aspect ‘Marquise’ room. This Marquise room has good views over the courtyard garden and some hand painted murals to the walls. Third Floor: There are a further two bedrooms to the third floor. Both of these bedrooms are accessed off a hallway, which has a traditional roof window. Each bedroom has a dormer window, which provides good views over the village of Rossio do Sul to Abrantes. The property is situated in the village of Rossio do Sul, south of the River Tagus and only about one kilometre from the large town of Abrantes. The property is set on a road within the village, however the provision of the courtyard garden provides privacy. There are several shops, restaurants and cafes within walking distance from the property. The property has good views from the first, second and third floors to Abrantes. Abrantes has a variety of supermarkets, restaurants, cafes, shops, cinema, bus and train station, schools, college and river beach. The property is easy to locate and has good access links to the A23 east west dual carriageway. The closest airport to the property is situated at Lisbon, which is approximately one and a quarter hours’ drive. Lisbon airport is serviced by several low cost airlines, which operate regular flights into and out of the United Kingdom.